With the winter weather slowly starting to invade our space, parents everywhere are trying to think of creative ways to keep their babies warm. We all know how important it is to keep the next generation of geeks cozy and frost free. Well, look no further, because the force is with you. The Etsy shop called The Fashion Whisperer has handmade Ewok leg warmers so cute that they would make the adorable furballs themselves jealous. Ewok dog costumes? That’s for chumps. Instead relish in these cotton blend brown and beige bad boys. Not an Ewok fan? That’s okay, there’s also Girl Darth Vadar ones, C3PO, and Han Solo among many other styles. The best part is they’re affordable, ranging from a price of $14.00-16.00. If you want to pick up a pair of these leg warmers, click on any of the photos to head over to their page. And make sure to check out even more from The Fashion Whisperer. 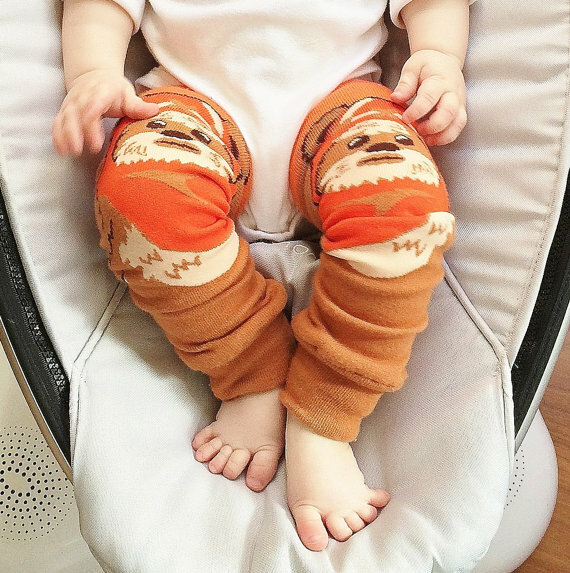 This entry was posted in Ana, Geek Chic and tagged Baby, C3PO, Clothes, Darth Vader, Ewoks, Han Solo, Leg Warmers, Star Wars. Bookmark the permalink.